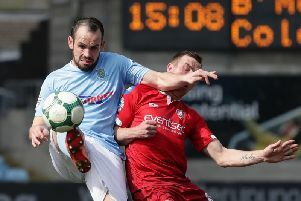 Ballymena United are through to the final of the Bet McLean League Cup after a 3-1 against Cliftonville at the Showgrounds. Goals from Leroy Millar, Tony Kane and Cathair Friel sealed Unted’s place in the final - where they will face Dungannon Swifts at Windsor Park on Saturday. In the 22nd minute the Reds had a chance. Jay Donnelly crossed from the right but his ball was just to high for the unmarked Joe Gormley at the back post. The Reds went close again in the 31st minute. Chris Curran found Conor McDonald. However he shot over when well placed. Jonathan McMurray was causing problems for the Reds defence and he had a couple of chances before the break but he failed to convert either. The second half started at a good pace with both sides pushing for the opener. in the 56th minute a Tony Kane corner caused problems but Braniff pushed it wide from a Cathair Friel flick. It was 1-0 to United in the 61st minute. McMurray found Kane - his shot was parried by Brian Neeson and Leroy Millar was there to knock it home. Were the holders heading for another final? It was 2-0 in the 73rd minute. A throw-in from sub Conor McCloskey found Kane and he headed home past Neeson. The Reds had a chance through Rory Donnelly but Glendinning saved well in the 75th minute. McMurray tried his luck in the 86th minute from long range but his shot was easily saved by keeper Neeson. It was 2-1 in the 89th minute as Cliftonville got a goal through a scramble in the United goal mouth and it was game on. it was 3-1 right at the death Friel shooting home from his own half after keeper Neeson had come up for a Reds corner. And Ballymena wil now face Dungannon Swifts in Saturday’s final. Ballymena Utd: Glendinning, Kane, Owens, Friel, Braniff, Burns (McCloskey 67mins), Balmer, Ervin, McCullough, Millar (Faulkner 86mins), McMurray. Subs not used: Flynn, Shevlin, McCaffrey. Subs not used: Dunne, Lavery, Grimes.